Rashanda represents clients in a variety of litigation and labor and employment matters. Prior to joining Fox Rothschild, Rashanda was a summer associate at the firm. She was also a judicial extern for the Honorable Kate Menendez of the District of Minnesota and the Honorable Sara Grewing of the Second Judicial Court. While in law school, Rashanda worked as a student attorney for the Child Protection Clinic and Innocence Clinic. She also served as co-president of the Mitchell Hamline Black Law Students Association, participated in the William E. McGee National Civil Rights Moot Court and was the administrator and a student member of the Warren E. Burger Inn of Court. 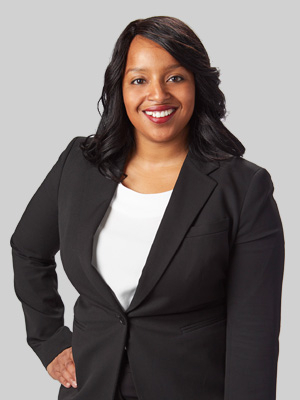 Before attending law school, Rashanda worked as a paralegal in the Minneapolis office of a national law firm. Rashanda is very involved in the Twin Cities community. She is a co-founder and leadership team member of LOCUS, a meeting ground that provides space and opportunities for authentic community building, identity-driven leadership and resource sharing by and for people of color and indigenous peoples. She has coached cheerleading for over a decade and currently serves as the Program Director and Head Cheerleading Coach for the Apple Valley Elementary and Middle School teams, where she instills and builds confidence and pride in young girls. Rashanda serves as a housing court volunteer for the Volunteer Lawyers Network, providing pro bono civil legal services to low-income individuals.